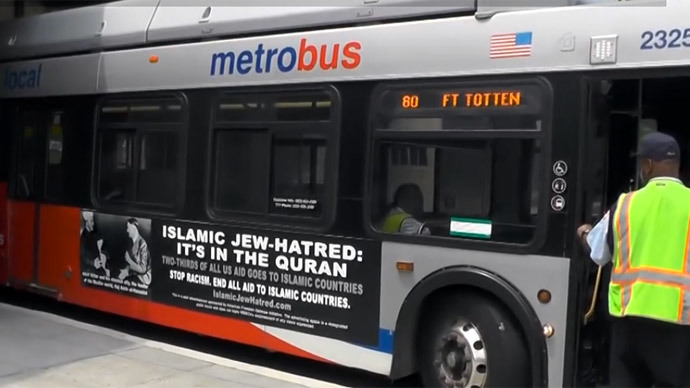 Controversial ads showing a 1941 photo of a Muslim leader meeting Hitler have begun appearing on buses in Philadelphia, after courts overruled the transit authority’s objections. “Islamic Jew hate: It’s in the Quran. Two thirds of all US aid goes to Islamic countries. Stop the hate. End all aid to Islamic countries,” the ad reads, next to the photograph of Adolf Hitler and the Grand Mufti of Jerusalem, Hajj Amin al-Husseini. Behind the campaign is the American Freedom Defense Initiative (AFDI), a pro-Israel group led by blogger Pamela Geller. AFDI has previously run the ad in public transit systems of New York, San Francisco and Washington, DC. They reportedly paid $30,000 for the Philadelphia ads. The Southeastern Pennsylvania Transportation Authority (SEPTA), which manages Philadelphia’s mass transit, initially declined to run the ads. AFDI filed a federal lawsuit, citing freedom of speech, and a federal judge last month ordered SEPTA to accept the ads. “After careful consideration,” SEPTA decided not to appeal the decision. “SEPTA regrets any discomfort that may be caused from viewing these controversial messages during the weeks they will be displayed,” the Authority said in a statement. SEPTA’s new advertising policy, adopted in October 2014 after AFDI’s request to buy ad space, allows the authority to reject political advertising without violating the First Amendment. This means AFDI’s ad will be displayed on 84 SEPTA buses through the end of April, but will most likely not be renewed. Philadelphia Mayor Michael Nutter denounced the ad at a news conference on Tuesday, with over 100 people gathering at the city’s Love Park, including religious community leaders. “We will not allow any misguided and opportunistic political tactics to undermine or obscure the shared respect among communities of faith, nor will we permit it to distract or disrupt our city as we prepare for a week in which we observe great religious traditions of Easter, Passover and other traditions that anyone else may enjoy,” Nutter said. “It’s the antithesis of Islam to go berserk and cause destruction, violence and vandalism against SEPTA,” said imam Mikal Shabazz, of the Masjidullah Center for Human Excellence in nearby Germantown. He urged Philadelphia Muslims not to “act in a manner which is unbecoming” when confronted with the ads. Appointed the Grand Mufti of Jerusalem in 1921, Mohammed Hajj Amin al-Husseini fled the British Palestine Mandate in 1937, and found refuge in Nazi Germany. He sought Hitler’s backing for Arab independence, and opposed the establishment of a Jewish state in Palestine. The meeting with Hitler captured in the photograph took place in December 1941. Al-Husseini subsequently helped recruit Yugoslavian Muslims for the Waffen-SS. He lost political influence after the 1948 Arab-Israeli War, and lived in Lebanon till his death in 1974.